The Los Angeles River, formed by a large watershed that drains the Santa Susana Mountains, the San Fernando Valley, and the San Gabriel Mountains, played an important part in the geological formation of the Los Angeles basin. Areas adjacent to the river comprised riparian ecosystems with a myriad of native plant and animal species. The river’s periodic floods provided rich sedimentary deposits across the floodplains. Today, no part of the Los Angeles River remains in a native state; every reach of the river has been altered and engineered. No longer able to recharge the earth it passes over, the Los Angeles River discharges its water unimpeded and unused into the Pacific Ocean. The Los Angeles River was critical to the founding of the city of Los Angeles, and the town became a thriving farming community, growing corn, wheat, grapes and orchard fruits irrigated by the Los Angeles River and its tributary streams. Because the river’s flows varied from a gentle trickle to violent, debris-laden floods, the Los Angeles River never cut a deep channel like many other rivers. The river flowed over a wide area of braided channels and meanders and changed its path to the Pacific Ocean. As Los Angeles grew, development occurred all along the river’s natural floodplain. Numerous catastrophic floods caused the U.S. Army Corps of Engineers to stabilize the river in the late 1930s by constructing concrete walls to contain flood waters. The 51-mile Los Angeles River begins in Canoga Park, flows through the San Fernando Valley, along the cities of Burbank and Glendale, along Griffith Park and Elysian Park, through Downtown Los Angeles and then through the cities of Vernon, Commerce, Maywood, Bell, Bell Gardens, South Gate, Lynwood, Compton, Paramount, Carson, and Long Beach. The first 32 miles of the river are in the city of Los Angeles. The MRCA is a participant in major river planning efforts, and creates innovative solutions using parkland to clean and infiltrate storm water. Completed projects include parks, bike trail improvements, public access points, greenways, and visitor-serving amenities that improve neighborhoods, create habitat, and promote public health. The MRCA’s parks and programs provide environmental education and equity to densely populated and underserved park-poor communities. Who owns the Los Angeles River? The Los Angeless County Flood Control District holds an easement over the river and the roadway adjacent to it on both sides for flood control purposes. The U.S. Army Corps of Engineers provides flood control operations and maintenance services in the river. The city of Los Angeles possesses rights to the river’s water. The MRCA owns and manages parks along the river. 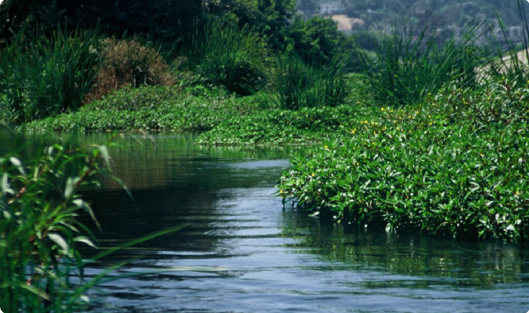 The MRCA administers the L.A. River Recreation Zone in the Elysian Valley and Sepulveda Basin which allows for kayaking, and fishing in the river in the designated zones during favorable conditions in the summer.